We were expecting conditions at last week's Market to look much like the below photo (minus the cars in the lot, of course), but the rain held off, and we wound up having a solid mid-May Market day. Produce and other items were sold to many patrons. Community groups were visited and spoken with. Performers performed. Sprouts at the Market went on as planned (over 60 kids planted bean seeds and learned a bit about how vegetables grow! Thanks, Master Gardeners!). There was a Bike Rodeo (thanks, C-U Safe Routes to School Project!). It got warm. All in all, lovely. Dare we hope for the same this week? Well, as this is being written, the weather forecast looks pretty good for the Market this Saturday, but slightly bumpy in the meantime. Mother Nature has been capricious at best... and incredibly destructive at worst this season in many other areas of the country. Our thoughts are with them; we've been pretty lucky here so far, even with last night's crazy weather. Today, it's just wet. Saturday? Hopefully 76 and sunny, with just a chance of rain. 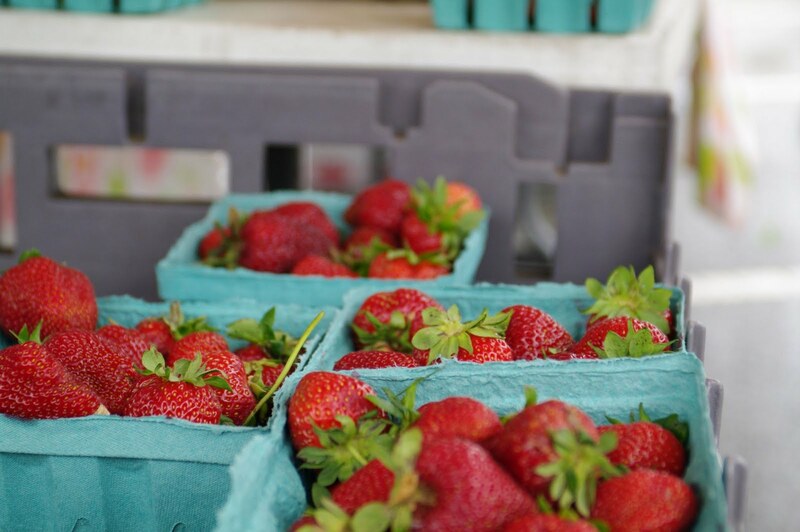 PRODUCE: We're hoping this week to see more strawberries to go with the spring staples like asparagus, lettuces, spinach, radishes, kale, chard, green onions, rhubarb, etc. 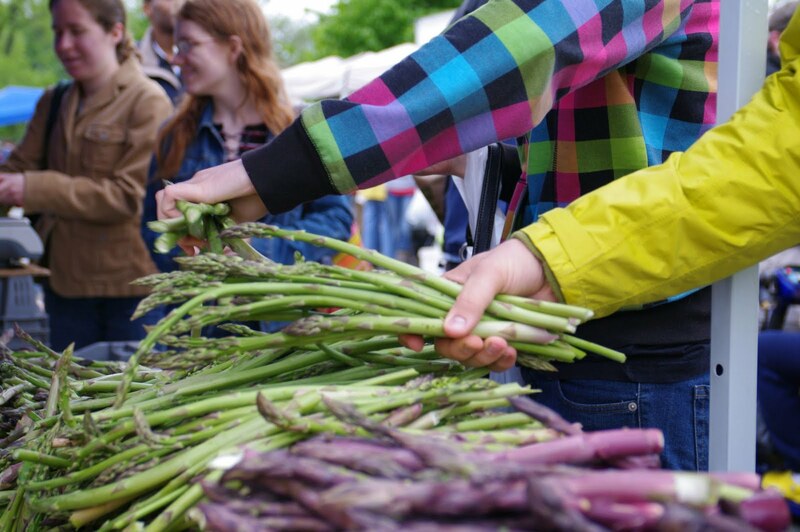 While there's nothing like local asparagus, there's NOTHING like local strawberries. You can also expect plenty of bedding plants, flower & vegetable starts, and cut flowers. There will be frozen meats, eggs, cheeses, farm-produced gelato, and honey as well. PREPARED FOOD: We expect plenty of baked goods (everything from bread to croissants to cinnamon rolls), hot foods foods suiting herbivores, omnivores, and carnivores, ice cream, kettle corn, and more. ART & CRAFTS: Woodwork, photography, batik, upcycled clothing, glass, jewelry, and much more will all be represented out at the Market. PERFORMANCE: We rarely know ahead of time who will come to perform, but you might run into some bluegrass music, some indie music played on a ukelele, some a capella singing, percussion, jazz flute, and more. ART AT THE MARKET: The Urbana Public Arts Program is bringing its Art at the Market workshops back for another season! Local artists will be out at the Market the last Saturday of each month working with patrons of all ages to be creative. This weekend's artist is Urbana resident Traci Pines, who will be offering up different ways to re-use various items and make them into a variety of things - really cool refrigerator magnets, for example. The workshops are free, no registration is required, and the art-making goes continuously from 8 AM - noon. Look for the tent near the NW entrance to the Market, in the community groups row. 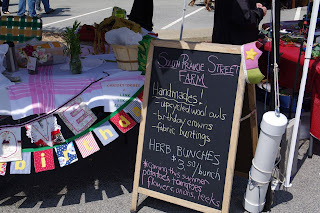 One bit of news related to all farmers markets in Illinois - it looks like SB840, Illinois' Cottage Food Bill, has passed both the Senate and the House and, after a short re-evaluation by the Senate, will go before Governor Quinn for consideration. You can read the text of the bill here. You can read an article about the bill here. The upshot? If Governor Quinn signs the legislation into law, home preparation of non-hazardous baked goods will once again be allowed at farmers markets in Illinois, with some basic restrictions (labeling food as being prepared in a home kitchen, the baker having a food service sanitation certificate, etc). This is a huge victory for entrepreneurs and farmers markets alike. It is expected that, if signed, the legislation will go into effect starting January 1, 2012. Thanks, as always, for your support of Urbana's Market at the Square. See you out there! The weather has not been so delightful (well, not these past few days), but see below for what can be had at our farmers market when the weather is coolish and dampish. We'll admit it - it was wet and chilly last weekend. But people still came out - thanks so much for all your support as we struggle with the frequently-iffy weather this spring. The produce offerings this week will look much like what you see above. Add to that our usual selection of frozen meats, eggs, honey, cheese, gelato, baked goods, prepared foods, "foodtruck food", art, crafts, community groups, and performance, and that's your Market for this weekend. Reminder: Urbana's Market at the Square no longer allows animals at the Market. There are exceptions: service animals are permitted, and animal rescue groups who are registered as a community group for that day may bring their animals to the community groups area, which is in the western row of the Market. Speaking of community groups and their new home - we have plans for this area. Patrons have mentioned a desire for a seating area, and we're working to provide seating in the western row of the Market by the beginning of June. We'll also be featuring performers in this area as well. Please swing through this weekend and visit with groups such as Retired Greyhounds as Pets (REGAP), Champaign County Forest Preserve, The Coffee Party of Greater C-U , Chambana Moms, Central Illinois Mosque and Islamic Center (CIMIC), AWARE, and several others. 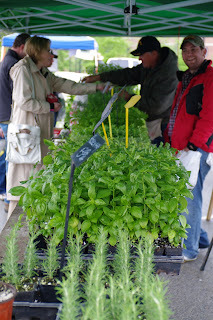 Sprouts at the Market's first event of the season will be held between 9-11 this Saturday. It's a seed planting workshop for kids - each participating child will plant a bush bean plant to take home, as well as learn about seeds and the life cycle of fruit and vegetable plants from the great folks at Champaign County Extension's Master Gardeners. The workshop is continuous over the 2-hour period, is free, and no registration is required - look for the Sprouts tent next to the City tent at the NW entrance to the Market. Each participating Sprout will receive a Certificate of Participation which can be used for special offers for participants at Common Ground Food Co-op and Art Mart Toys, both located inside Lincoln Square Mall. In the event of rain at 9 AM, Sprouts will be canceled. The next date will be June 18. The C-U Safe Routes to School Project is holding a bike rodeo at the Market. Look for their setup in the parking lot south of the Market, across Illinois Street. They'll be fitting kids for (and selling) bike helmets, teaching kids about bike safety, helping kids through an obstacle course, and more. Please cross your fingers for a rain-free Market, as the current forecast is calling for, um, a little bit of rain. Bring your rain gear and umbrellas! As I write this on Wednesday, it feels positively summery outside - the temperature is 83 degrees and the heat index - HEAT INDEX! - is 87 degrees. Second week of May... or first week of July? These few days of heat and relative dryness are temporary (we should be back into the 60s for highs by the time Saturday's Market arrives), but they're going to move things along pretty quickly on the produce front. You can still expect the usual spring things, like asparagus, spinach, rhubarb, lettuces, some fresh herbs, green onions, kale, chard, radishes, and sprouts. 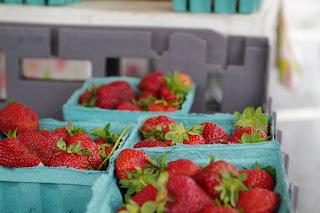 But maybe... just... maybe... we'll see some strawberries from southern Illinois at the Market in enough quantity that people arriving after 7 AM will be able to buy some. Strawberries! Also, don't forget vegetable and flower plant starts. There will be a huge variety of plant starts available at the Market this weekend - especially tomato, pepper, and other vegetable starts. It's definitely time to get your garden on. Eevn if you don't garden, you can still pick up floral arrangements, hanging baskets, and other greenery at the Market. Add to this the baked goods, the prepared food (Veggie Trails is back this weekend, Fryer Tuck is in the house, the folks from Red Herring will be there, and a new BBQ joint will be joining us), the art and crafts, the community groups, and the performances, and you have a banner second Market of the season. Speaking of community groups, please swing through and check them out - they're in the new Row One, facing you as you enter either of our main two entrances at the NW or SW ends of the Market. We plan on having special events, performers, and possibly even seating out there as the season progresses - please come by, pay these groups a visit, and help create a true public square atmosphere! Reminder: Animals, with the exception of service animals, are no longer allowed at Urbana's Market at the Square. Please leave your pet at home when coming to the Market. For more information on this policy please click here. For another explanation from a different source, please check out the News-Gazette's editorial here. We had a banner week with many patrons using Market Scratch on Saturday - thanks! Market Scratch is just another way to pay at the Market, especially if you run out of cash. Market Scratch credit and debit tokens make excellent gift for the Market-goer in your life, too. Click the link above for more information. This week: U-Cycle, Urbana's recycling program, will be on hand to answer questions about recycling all kinds of items. Courtney Rushforth, the program's coordinator, will be at the Market from 8 - noon to answer your questions. 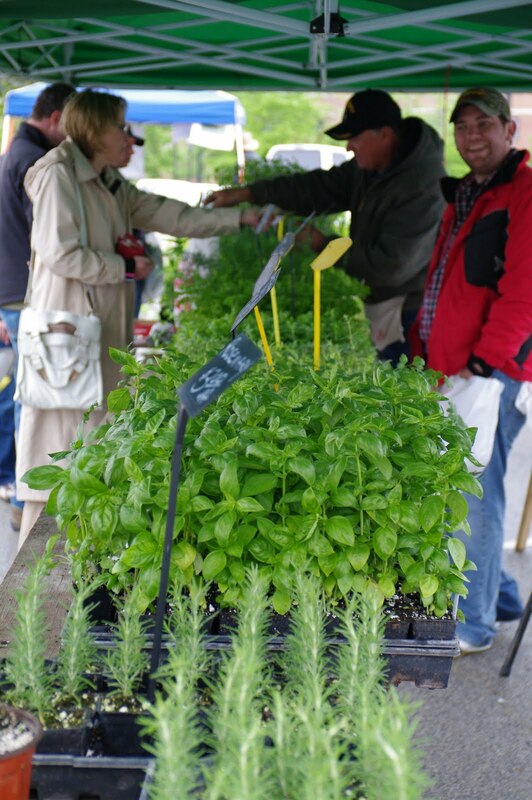 Next week: Our first Sprouts at the Market event of the season will be held in partnership with the Illinois Master Gardeners. They'll be teaching kids about seeds and planting from 9 AM - 11 AM. The 2011 Season Can't Come Fast Enough! Man, what an off-season that was! In some ways it doesn't even feel like it's done with us yet... I mean, it'd be great to see the sun for two straight days, wouldn't it? But the rain has brought us big bursts of green. The photos above were taken last spring, but it's a good representation of what you'll find to eat at the Market this time of year: green stuff. 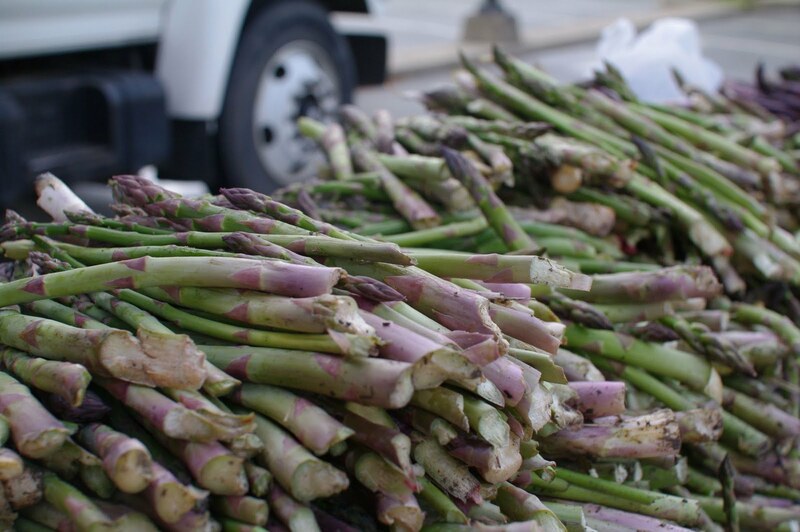 We'll have lots - asparagus is in season now, and it is GLORIOUS; there'll also be plenty of green leaves to choose from, like spinach, lettuce, chard, and kale; there'll be some green onions. We'll also have bedding plants and vegetable starts... and maybe even a few flowers. 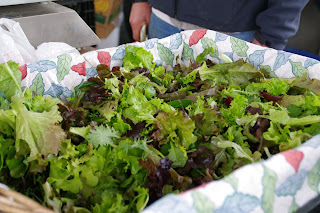 Vendors like Kleiss Produce, Blue Moon, Moore Family Farm, Meyer Produce, Tomahnous Farm, Cary's Garden of Eatin', Tiny Greens, Owens, Ropp's, and others will be out in force. It won't all be green. There's a chance we'll have some strawberries from southern IL. Some rhubarb, I'm thinking. There will be, of course, farm-raised eggs and frozen meats and varieties of goat cheese and gelato. There will be baked goods and pastas. There will be FOOD. Finally. - Patrons are being asked to leave their pets at home - this includes dogs, cats, birds, ferrets, foxes, and other animals. The overarching reason for this is patron and animal safety - the Market is crowded, and we've experienced some close calls out there over the last three years that could have gone either way. If you bring your pet to the Market after May 7 (we're allowing this Saturday to be a grace day), you will be asked, very nicely, to have someone else watch your pet while you shop. For more information about this policy, please click here. - Community groups have been relocated to Walnut Street, the street just to the west of the main Market site (for those familiar with the Market, it's the street behind Row One). The area they formerly occupied, the north side of the Market, will now be home to food vendors. Please take a swing by the community groups before you enter the Market - you can't miss 'em if you come in either of the two main entrances. - Last year we introduced our credit/debit/LINK card acceptance system. It worked so well, we decided to keep it! We've renamed it "Market Scratch" (because our logo's a chicken, get it?) and are trying to get the word out about it. In short, it's another way for patrons to pay. Cash is still king with vendors, and checks are accepted by most, but if you've run out of the former or have forgotten the latter, Market Scratch can help. More information about how it works is here. Please stop by the City tent to ask questions or see it in action. This weekend we'll have the Urbana Free Library out for a visit, weather permitting. Speaking of, the Market is being featured in their display case near the library's eastern exit. Go by and see! And speaking of weather, click here or here for weather forecasts, and remember: Your umbrella is your friend! The Market staff is really looking forward to seeing the Market filled with patrons once again. Next week - more information about our Sprouts program and other special programming you can look forward to, another food update, and more!